The cold weather might have driven you inside, but a screened in porch still makes for an excellent outdoor living area. The cold weather might have driven you inside, but a screened in porch still makes for an excellent outdoor living area. But in the winter, you can enjoy the fresh air while shielding yourself from the biting cold and howling wind. Plus, on unexpectedly mild days when there’s no rain, you can still enjoy the view of your landscape. Here are three things to keep in mind when you set out to design a screened in porch. First things first, where will it go? This question should be at the forefront of your mind when you start designing the new screened in porch. You can have it connect your home and the yard around it. For instance, it can be a quick escape from the unpleasant weather or a place to warm up after some vigorous shoveling. Once the weather turns warmer than it is now, you can use it as a place to entertain – from a viewing party for the Super Bowl to a great place to grill once spring and summer return. If anyone in your family has trouble getting around, you’ll need to factor that into your decision as well. After all, your porch should be a place everyone can safely gather in and feel comfortable and cheerful. Keep the floor level, repair any steps or railings, and make sure the door can accommodate wheelchairs if need be. Once you’ve built your screen porch, it’s time to make it a place to live! Don’t overlook or downplay the importance of the finishing touches for your new space. Will you upgrade the ceiling, or add an outdoor fireplace? The choice is yours! You could even decide to jazz up the flooring and make the floorboards more visually appealing. Give it a cozy enough feeling, and you’ll never want to leave. 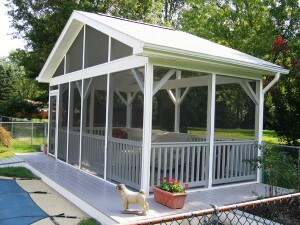 Get a Brand New Screened In Porch This Winter!